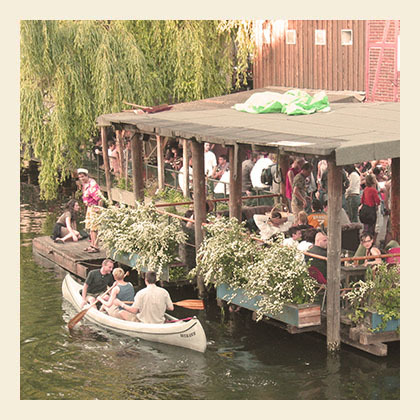 Here are some party-suggestions from your favorite place to stay in Berlin, EastSeven Hostel. selbstgebrannten “Moonshine”. Howdy & Yeehaw!! For our debut in 2012 we are taking the stage and raising the roof again at the world famous Bassy Club, the supernova of 60s beats in the centre of the universe. And don’t forget: the world will end in 2012. If you missed Les Decadents, it will torment you for ever while you roast in hell. So don’t be a stick-in-the-mud couch potato, get out your horns and trident, bring your fire and brimstone and come and get roasted at the hottest party before Armageddon. Berlin’s premier techno club, housed in a former power generation plant near the Berlin Ostbahnhof train station. The building is enormous — the dancefloor 18 metres high and there’s room for around 1500. The main design elements are steel and concrete. The first room at the entrance near the cloakroom displays a 20-30 square meter black & white painting of the artist Piotr Nathan. On the upper floor, the Panorama Bar contains a large-format painting by Wolfgang Tillmans. Fridays is usually upstairs Panorama Bar only. Saturday night through Sunday both rooms are open. Enjoy your party weekend in Berlin!! !